We are one month into a new school year. Are y’all as crazy busy as my family? Looking at my calendar I’m seeing only one weekday night per week in which we have nothing scheduled. How did that happen? If your family life is anything like ours, dinner can get pretty tricky. Back in the day, crockpot cooking was the solution for busy families, and I definitely have several tried and true crockpot dinners in our rotation. Honestly, though, slow cookery is not my favorite. Today it seems Instapot cooking is all the rage, but I have resisted the pull; mostly because the idea of a pressure cooker freaks me out a little. Recently I’ve discovered sheet-pan roasting and I am in love. An entire supper, fit to feed a crowd, roasted together on one pan and ready in 20-40 minutes. Amen! 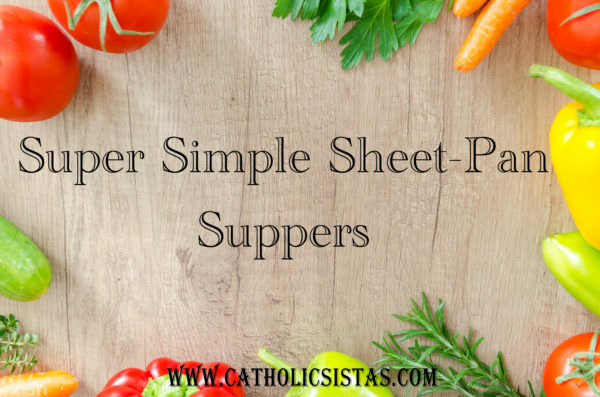 Have you tried sheet-pan cooking? If not, I’m sharing my favorite variations today. If you have, feel free to share your favorite recipes in the comments.